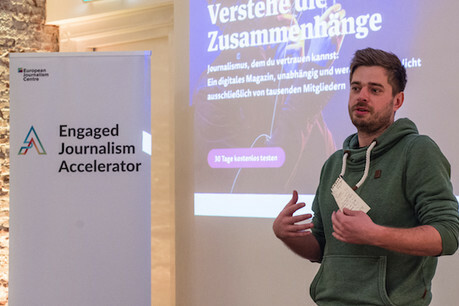 Eight more recipients have been announced for the Engaged Journalism Accelerator (EJA), a funding scheme by the European Journalism Centre (EJC). The scheme is designed to help community journalism projects find long-term sustainability. Since launching in April 2018, four organisations have been awarded up to €50,000, in a bid to promote and strengthen their community outreach amid claims that media should be engaging more with their audiences for the sake of their future. Today's announcement brings the total number of recipients up to twelve, hailing from various parts of Europe. Ben Whitelaw, engagement lead, EJC was central to whittling the 128 applicants down to just eight. One of the criteria was what barriers those organisations were up against, how central the community was to their work, the expected impact of their proposal, the speed with which they could execute their vision, their willingness to share their findings and its potential to be a self-sustainable business — something perhaps to bear in mind for other prospective grant applicants. "They all showed incredible potential to support their community and to tell the stories of that community in a way that other organisations are not doing and in all cases their journalism is about having an impact," said Whitelaw. "The accelerator is about helping these organisations to do that in a more sustainable way." He assured applicants who missed out that they can still receive other optional elements included in the scheme, such as the support of their sustainability partners and blockchain platform Civil. For those interested, this means newsrooms can gain access to Civil technology, CVL Tokens and mentorship.